I decided to give myself a challenge to see if I could make a quilt I designed, in one day. 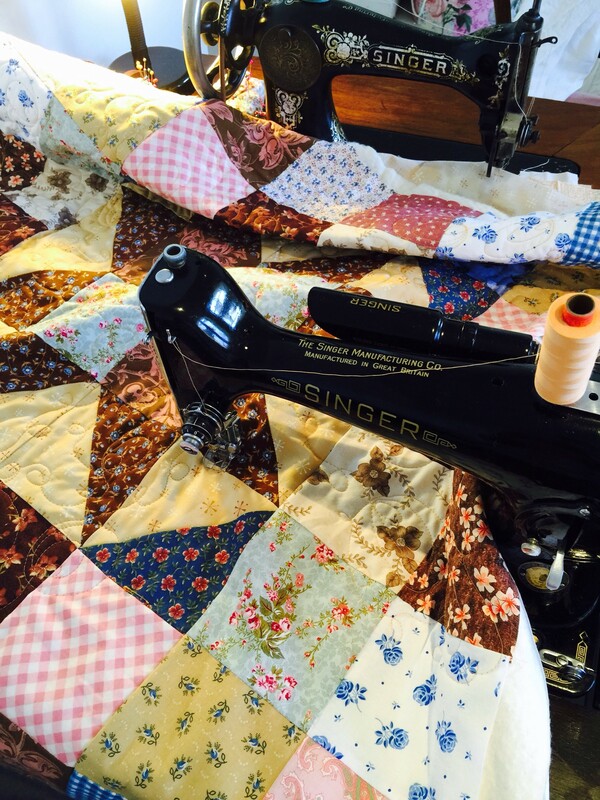 I briefly toyed with the idea of a rag quilt, but, then it meant another trip to the shops. As I was not sure what I wanted or if I would find what I wanted, I decided it might be a waste of time. So that’s when I decided to stick with my plan to make a more conventional quilt and not waste time shopping. I just wanted to see if it was possible to make it in one day? Having thought about this quilt for quite some time, I’d already planned it in my mind, although I had not yet picked all the fabrics. 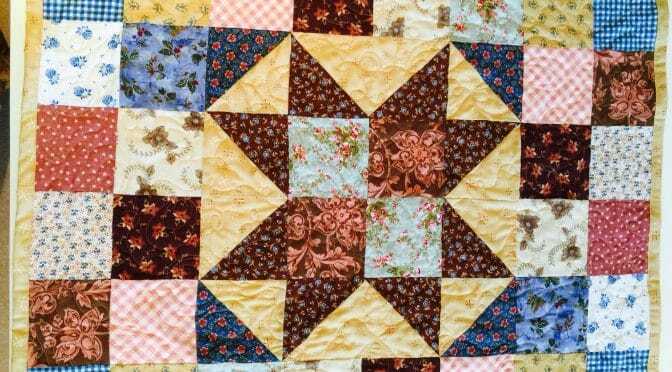 I’m inspired by some of the antique baby quilts. I love the way they transcend time and can be just as beautiful one or two centuries later. Although it can be nice to make “baby” quilts with novelty prints, I like the idea of a quilt for a baby which is not necessarily “babyish” in choice of fabrics and will still have appeal later too. 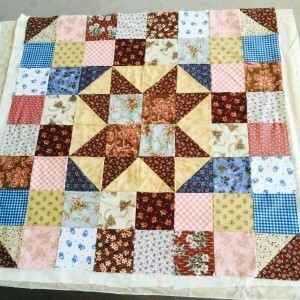 I think it’s really nice to incorporate fabrics which would by used in “big” quilts for a “little” quilt. Simple design and good colour placement can make a beautiful quilt. I sorted out the fabrics I wanted to use and chose a lovely star gold fabric for the backing. I incorporated some of that backing fabric into the star to coordinate the quilt. I chose a palette of browns golds, blues and a few pinks for this baby boy quilt. I laid out my fabrics into the design I wanted and started sewing. I had decided to make a self binding quilt too, so the backing piece I chose was larger to ensure I would have enough left over to turn the edges over towards the front of the quilt at the end of the quilting. 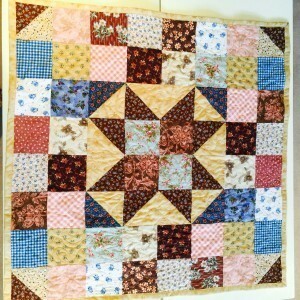 I free motion quilted this project. I quilted it with a triple looping pattern which I considered would be nice for a baby boy quilt. I quilted it on my Vintage 1948 201 K Singer sewing machine. 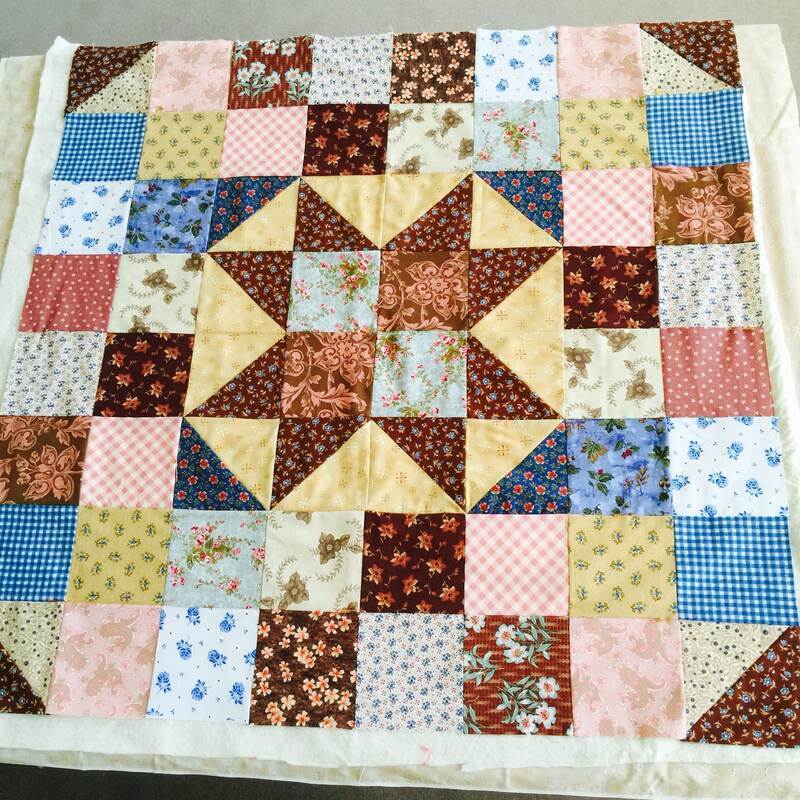 Once the free motion quilting was completed I trimmed the batting very carefully to line up with the edge of the quilt top. I then trimmed the backing leaving a generous 1 1/2 inches all around to allow for a double turn. I machine stitched the turned binding on the front of the quilt. As an approximate guide, it took about 5 hours to make this quilt. 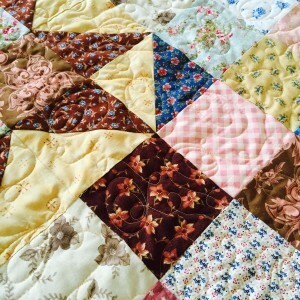 If you would like to make this quilt, and are new to quilting, allow at least two days instead of one. Also if a conventional binding is chosen I would also allow an extra day. Having said that, I was pleased to meet my own challenge. 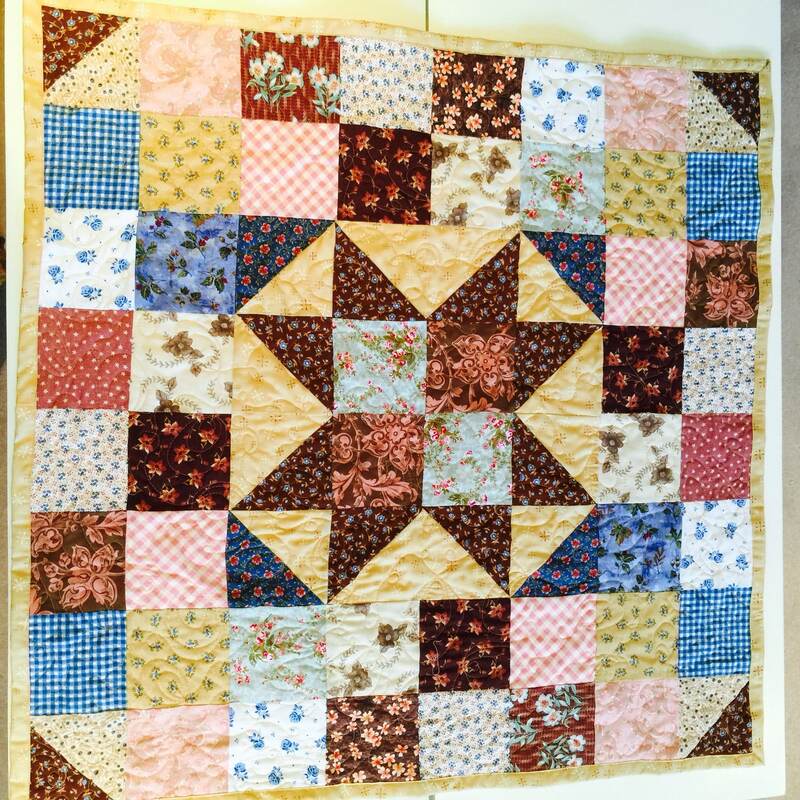 This quilt measures approximately 36″ square. My only problem is deciding what to make first…the Star Baby Quilt, the Heating Pad, or the Quilted Basket or Rope Covered Basket (that may not be the exact name, but you know which I mean)…I love all your tutorials…they are very clear for me to follow. Thank you for sharing!